This is the long-anticipated sequel to The Bronze Horseman…and very worth the wait! T&A is rough going, though. By this I mean emotionally discomforting. Now, I was in the middle of this book when the United States went to war in Iraq, and I was hearing reports of soldiers being abducted, bringing Alexander’s POW experience to vivid life. That was when I had to put the book down and wait until the initial stages of the war were complete. How this coincidence turned my stomach! The fighting, the torture, interrogation, death, pain of separation, the unbearable suspense–and I’m not at all saying anything negative about the book itself. In fact, this is quite a compliment. That it provoked such an intense reaction, it was REALISTIC and hard-hitting, and what a feat that is for a novel. 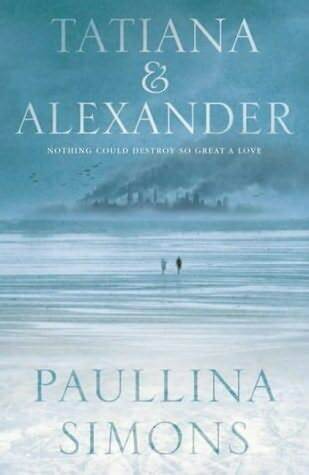 It was fascinating reading Alexander’s point of view: the first half of the book was Alexander reliving his childhood, recounting how he met Tatiana, and exploring his love for her and the month spent alone together at Lazarevo. Introspective and inviting, the same events were explored from quite a different point of view– the view of a volatile and tortured man. The main focus later in the novel is his experience as a POW. Harrowing and poignant, it kept me on the edge of my seat. The story was not just Alexander’s, however–Tatiana narrowly escapes the war-torn Stalinist Soviet Union to America at the age of 18 and pregnant, believing herself a widow. How she copes in a foreign land, grieving and not knowing what to believe, and desperately grasping for hope is her narrative, just as heartbreaking and powerful as Alexander’s trials. The story of these ardent lovers is, I believe, based on the lives of Simon’s grandparents. Only inspiration from real life can be this affecting, in my humble opinion. Life is stranger than fiction! This book is fantastic at the end of it all. Not as perfectly crafted as its predecessor, it is still legions above most fiction out there today.